Sci-fi junkies and warm-weather lovers, rejoice! A three-day science, sci-fi and fantasy conference will take place in September on Hawaii's Big Island. The event, called HawaiiCon, will feature the cast of "Stargate Atlantis," Walter Koenig (Chekov from "Star Trek") and celebrities from "Games of Thrones," "Xena" and other hit sci-fi shows. In addition, the conference will feature some of the island's cutting-edge astronomy and mock Mars missions, as well as ancient Hawaiian mythology. The occasion marks the 10-year reunion for the cast of "Stargate Atlantis," as well as the 78th birthday bash of "Star Trek" star Koenig. Actors Claudia Christian and Patricia Tallman from "Babylon 5"; Richard Hatch, Michael Hogan and Kate Vernon from "Battlestar Galactica"; Esmé Bianco from "Game of Thrones"; and voice actress Cree Summer from the animated reality show "Drawn Together" will also be in attendance. Writer and producer Jane Espenson will also appear on panels and will host a writing workshop. The conference will feature robotics teams, astronomers and aerospace experts talking about dark matter, asteroids, nebulas, exoplanet discovery and Mars exploration. The panelists will include NASA Mars mission scientist Bobak Ferdowsi, better known as "Mohawk Guy," planet hunter Andrew Howard of the Institute for Astronomy at the University of Hawaii and software engineer Larry Denneau of the Asteroid Terrestrial Last-Alert System (ATLAS) telescope project, among others. Experts on Hawaiian culture will also be on the scene to talk about ancient Hawaiian knowledge of the natural world. In addition to panels and workshops, conference attendees will have the chance to go on tours, take part in a Hawaiian luau ceremony, have a hula lesson or go to the beach with star panelists. 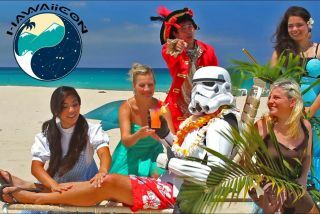 HawaiiCon is scheduled to take place Sept. 12 to 14. Tickets are now on sale, and start at $75. They are available for purchase here. Tanya Lewis will attend HawaiiCon in Hawaii for Space.com on a trip paid for by the Hawaii Tourism Bureau.